High rise painting can be performed using abseiling access techniques and provides a extremely cost effective solution to access and painting a whole high rise building without the need of scaffolding or swinging stages, high rise painting can be performed on any type of building or structure, no matter how high or difficult to access we have a solution and we will able to provide the right painting services for you. 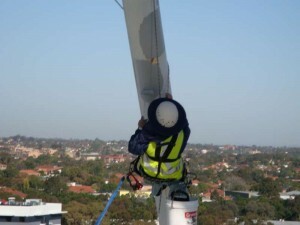 Commercial high rise painting access require various types of external facade building maintenance. Personnel need to carry out various task from high rise window cleaning to full facade painting works all using industrial rope access where abseil access personnel descend to the external facade to carry various works. All our personnel are part of our height awareness program for high rise painting where we hold fortnightly safety meetings to discuss specific site safety issues, brain storm new techniques, and discuss industry issues with methods and work techniques. We provide external high rise facade remedial building works. All using Industrial Rope Access such as full facade renovation, cladding installation and/or concrete rejuvenation, and high rise painting to any type of surface. All buildings requires some type of remedial building maintenance. Our industrial rope access personnel can provide all the solutions where other may use expensive equipment. We utilize our specialized skills to provide a cost effective solution for any type of external facade building maintenance. Please inquire to see what services we can offer. No matter how high or how difficult the task is, we can guarantee that we can provide you with a cost effective solution unsurpassed by others. 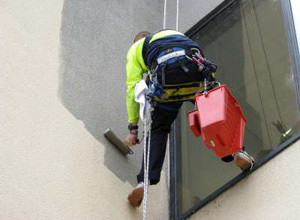 Our high rise painting specialists can provide a service above none. Call our Project Manager for a FREE quote!!! Client Satisfaction – Work Guaranteed for every job!! !